Journalist/activist Mike Cernovich reports that former White House National Security Advisor Susan Rice obtained intelligence reports showing the identities of innocent Americans who incidentally spoke to foreign officials under security sweeps for spying or intelligence activities. Under U.S. law, U.S. persons are protected from such disclosure, which could be dry-cleaners asking envoys to pick up their laundry or wrong number phone messages spilling their guts about their mothers-in-law. If such U.S. persons get swept up in surveillance, they are protected. But only if they remain ‘masked,’ which is the law of the land. Cernovich says the White House Counsel’s office has confirmed that Rice was one of the few officials with the authority to make the requests to unmask the innocent Americans caught up in surveillance dragnets. There was no national security reason to do so, but she did. 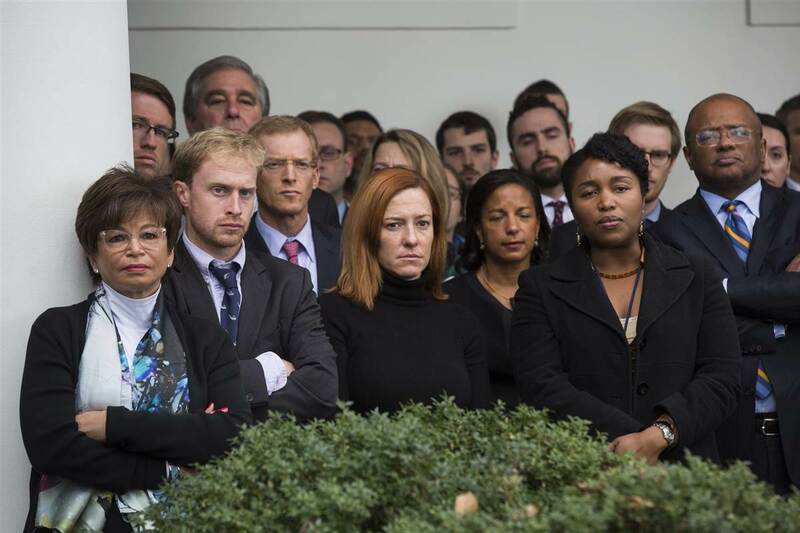 It makes a lot of sense if the aim is political, however, and White House spokesman Sean Spicer has pointed out that their goal was ‘to leak stuff.’ Based on White House logs, she did, during the transition back when angry miserable Obama White House officials frowned in a group photo for the cameras. The White House counsel’s office disclosed these logs to House Intelligence Committee Chairman Devin Nunes, who has been as responsible a steward of America’s secrets as anyone (and said nothing). But it would mean that Rice had to have been responsible for the illegal leaking to the press of the legitimate activities of people like her NSC successor Mike Flynn, for political rather than national security purposes. This would be true whether she did it herself or dispatched a flunky like fellow NSC official Ben Rhodes or Joe Biden’s NSC man Colin Kahl to execute the dirty-tricks skullduggery. It’s par for the course. Rice was the speaker of the infamous phony White House talking points on why four Americans, including Ambassador Chris Stevens, were slaughtered in Benghazi on 9/11/12, repeatedly stating for the press that the attack on the U.S. compound was the act of a spontaneous crowd that got out of control over a video, and not the pre-planned, lethally executed al-Qaida terrorist attack it was. After that, she went onto support the admittedly phony narratives about the Iran Deal, which her buddy Ben Rhodes, a creative writing major, cooked up out of thin air, just as he did the Benghazi talking points. Cernovich reports that New York Times reporter Maggie Haberman (caught on Wikileaks for being in the tank with Obama) had the information, and chose to sit on it to protect the former president. But based on the White House counsel act, the news nevertheless got out. The story meshes well with what FBI Director James Comey told the House Intelligence Committee, in response to Nunes’ request for information on leaks last March 20. Comey told the committee that only 20 people would have had access to the names of innocent Americans caught up in the spy dragnet during the transition. Rice was one of them. With a pattern of malice and mishandled security information centered around NSC dead-enders, the one thing we can see is that there is a coterie of illegal leakers who will compromise national security to enact their political aims. Devin Nunes pointedly asked Comey whether he knew that illegally leaking national security secrets was a jailtime offense. The FBI director said yes. It’s time to start investigating this arrogant abuse of power now. Comey has not stated whether he is investigating these people or not, and this is proper. But with these dead-enders clearly threatening the Trump presidency, it’s time to see a hard hand come out against these deep-staters who don’t know when to leave office, and who subscribe to the leftist situational ethics of ‘by any means necessary.’ They are poison for our republic and if they are not removed, they will destroy the Trump presidency. We learned this week that surveillance of Trump began long before he was the Republican nominee, and that the names in the intercepted communications were “unmasked” — that is, identified by name or context — by someone high up in the intelligence community. The best summation of this week’s distraction — respecting chairman of the House intelligence committee, Devin Nunes — is Victor Davis Hanson’s which I urge those of you interested to read in its entirety. Some notion of such intrigue, or rather the former nexus between Congress, the Obama administration, the intelligence agencies, and the monitoring of incoming Trump officials, was inadvertently disclosed recently by former Obama-administration Department of Defense deputy assistant secretary and current MSNBC commentator Evelyn Farkas. In an interview that originally aired on March 2 and that was reported on this week by Fox, Farkas seemed to brag on air about her own efforts scrambling to release information on the incoming Trump team’s purported talks with the Russians. Farkas’s revelation might put into context the eleventh-hour Obama effort to more widely disseminate intelligence findings among officials, one that followed even earlier attempts to broaden access to Obama-administration surveillance. In any event, the White House invited the highest ranking members of the House and Senate intelligence committees to come view the documents themselves. Adam Schiff did, and reported he’d seen what Nunes had, after which he did not deny the intercepted communications contained nothing about Russia or Trump. They clearly were of no national intelligence significance, but rather, as Hanson noted, were evidence that the prior administration was snooping on political adversaries using the apparatus of the state to do so. We also learned this week that Hillary (despite her uncontested mishandling of classified information when she was Secretary of State), and her aides, including Farkas, were given access to classified information long after she left the Department of State which, with Farkas’ admission on MSNBC, underscores the apparent misuse of intelligence from her end. There is no need to rehash the strange political career of FBI director James Comey during the 2016 election. As Andrew McCarthy has noted in his recent NRO analyses, news accounts alleged that Comey’s FBI investigations of supposed contacts between General Michael Flynn and the Russian ambassador were shared with Obama-administration officials — but why and how we are not sure. Comey himself was quick to note that his agency is investigating supposed collusion between Team Trump and Russia, but he refused to comment on whether or not the FBI is investigating possibly inappropriate or illegal intercepts of Trump officials and the surely illegal dissemination of intercepted info through leaks to favorable media. But there’s much more to be said about him and his “investigation” which seems to be continuing only to cover his own backside. The FBI was concerned that the ill-secured DNC internet communications were being hacked and sought to examine them. The DNC refused and engaged an outfit called Crowd Strike to do the job. Crowd Strike reported the Russia had likely tapped their server. There’s no explanation of why Crowd Strike was chosen, why the FBI allowed this, and why it apparently relied on that outfit’s findings. Recently Crowd Strike has walked back many of its claims after a VOA report that the company misrepresented data published by an influential British think tank. And then there’s the dossier compiled by the former British intelligence agent Christopher Steele. If you recall, this dossier was commissioned through a DC firm, Fusion GPS, by Hillary to dig up opposition research on her opponents, and when she dropped it, unnamed Republicans followed up on the contract. At some point (accounts vary about how this occurred), dog in the manger John McCain got it and widely distributed it to the press and political figures. These Republicans, too, dropped the service, at which time the FBI picked it up, though they claim not to have paid GPS. Comey apparently has based his still ongoing “investigation” on it. The dossier is utter bunk. Ironically, it is Fusion GPS that is tied to Russian intelligence. “It is highly troubling that Fusion GPS appears to have been working with someone with ties to Russian intelligence — let alone someone alleged to have conducted political disinformation campaigns — as part of a pro-Russia lobbying effort while also simultaneously overseeing the creation of the Trump/Russia dossier,” writes [Senator] Grassley. Akhmetshin hired Simpson and Fusion GPS last year to work on a campaign to roll back the Magnitsky Act, a law passed in 2012 which imposed sanctions against a handful of Russian criminals accused of human rights violations. The law was named in honor of Sergei Magnitsky, a Russian lawyer who was killed by jail guards in 2009. Magnitsky was working for Bill Browder, a London-based investor who once operated in Russia, when he uncovered a $230 million fraud being carried out by the Russian government. After Magnitsky’s death, Browder began lobbying U.S. lawmakers to enact sanctions against Russian criminals engaged in human rights abuses. In a FARA complaint submitted in July, Browder laid out the case that Akhmetshin conducted a covert lobbying campaign to hinder the Global Magnitsky Act, an expansion of the original law. Citing current and former government officials, the New Yorker reported the dossier prompted skepticism among intelligence community members, with the publication quoting one member as saying it was a “nutty” piece of evidence to submit to a U.S. president. Maybe Comey is continuing the investigation to blur his own role in the Obama administration’s improper and illegal snooping on his party’s opponents. He has not closed the investigation despite its apparently flimsy basis, perhaps to protect himself. He was supposed to report this investigation in a timely manner to the Congressional and Senate intelligence committees and did not. The uncomfortable aspect to this line of inquiry is Comey’s transparent knowledge of the politicized Office of the DNI James Clapper by President Obama. There is only one reasonable explanation for FBI Director James Comey to be launching a counter-intel investigation in July 2016, notifying the White House and Clapper, and keeping it under wraps from congress. Comey was a participant in the intelligence gathering for political purposes — wittingly, or unwittingly. As a direct consequence of this mid-thought-stream Comey obfuscation, it is now clear — at least to me — that Director Comey was using his office as a facilitating conduit for the political purposes of the Obama White House. It’s possible that the tissue-thin, incredible Steele “dossier” was not the only disinformation source. At the Spectator there’s a plausible account of how Obama’s CIA director John Brennan worked with Hillary and certain Baltic figures to discredit Trump with the charge of collusion with Russia. “Last April, the CIA director was shown intelligence that worried him. It was — allegedly — a tape recording of a conversation about money from the Kremlin going into the US presidential campaign. It was passed to the US by an intelligence agency of one of the Baltic States,” reported the BBC’s Paul Wood. Both Brennan and officials in the Baltic States had strong incentives to help Hillary and hurt Trump. That Brennan and some Baltic spies teamed up to inflate the significance of some half-baked intelligence from a recording isn’t surprising. Only in such a feverish partisan milieu would basic questions go unasked, such as: Is it really a good idea to investigate a political opponent on the basis of a lead provided by a country that wants to see him lose? Flynn was Obama’s head of the DIA (Defense Intelligence Agency) and served only days under Trump. Reports this week initially made it appear that he was under investigation for ties to Russia, but it is more obvious to me that he knows about skullduggery by the prior administration in the Middle East, most likely Iran, and wants protection against the sort of unwarranted prosecutions Ted Stevens and Lewis Libby suffered at the hands of vindictive Democrats and their minions. The charges against him are being leveled by former Obama aide Sally Yates, who has utterly discredited herself earlier by her demonstrably false claim that the White House blocked her from testifying to Congress when the documentation clearly shows she was not. Perhaps the easiest thing to do is to just consider everything the Democrats say, directly or through the media, which just prints as truth handouts from the same Democratic sources, as a lie. You’d save a lot of time and most likely be right. The day after Republican House Intelligence Committee Chair Devin Nunes held a press conference saying he’d seen reports that show the government may have collected information on Donald Trump’s transition team or family and then inappropriately shared it, journalists jumped into action. Not to dig into the accusation of NSA unmasking or a failure to minimize incidentally collected information — as they most surely would have had any Democrat been president — but to figure out where the congressman had been the past few days. This seemed to escape the attention of erstwhile civil libertarians who once breathlessly warned us about the potential abuses of intelligence services, and specifically about the dangers of politicians getting entangled in the exploitation of sensitive information. They wanted to know what Nunes had for dinner last Tuesday night. Certainly, as part of the larger story, it’s legitimate and useful to cover Nunes’ actions. When it turned out that he had been on White House grounds — probably to use a sensitive compartmented information facility — it gave Democrats the space they needed to start demanding recusal. “Calls Grow for Nunes to Step Aside in Inquiry on Surveillance,” says The New York Times. “The remarkable calls,” it goes on to say, “by Representatives Adam B. Schiff of California, the committee’s top Democrat,” came after revelations that Nunes had met a source at the White House. Democrats claimed that a “bipartisan investigation” could no longer be achieved. For starters, the idea that Schiff isn’t a full-blown partisan is preposterous. He’s already made a number of wild and irresponsible claims about Russia “hacking our election.” (The California representative contends to have conclusive evidence of collusion, though he’s yet to share the specifics with the group.) There is no reason to treat him like the guardian of a chaste investigation. Others who went on the record to demand recusal were nonpartisan public servants like Nancy Pelosi and Chuck Schumer. Ostensibly, demanding recusal is framed as an effort to save the impartiality and integrity of the committee. In reality, it’s meant to create the impression that Nunes has done something unethical or illegal to defend Trump. It meant to proactively poison any investigation. Schiff offers two reasons for his position: 1 – Nunes shared information with the White House. 2 – Nunes got his information from someone in the White House. Nunes has said this isn’t an inquiry into charges of Russian collusion, so why is it inappropriate for the House Intelligence Committee Chair to share intelligence about the president with the president — and then let the world know he’s done so? Furthermore, why is it wrong for the House Intelligence Committee Chair to see classified information from a source at the White House? “If that’s where the information is, and the information is relevant, and it’s authentic, and it’s reliable, wouldn’t you go where the information was?” Gowdy asked The Weekly Standard. Even if we concede, for the sake of argument, that Nunes had been ethically compromised, does the information attained in the effort become less valid? Were the leaks that cost Mike Flynn his job any less persuasive because they were illegally obtained? Haven’t many Democrats been defending the need for whistleblowers to speak up in the name of democracy? Schiff has no reason to give up the name of his source. If the NSA abused its power, and the evidence is legitimate, we should welcome the information. If not, Nunes’ credibility will be blown forever. Considering Nunes’ history, the media had no reason to assume the latter, which mirrors the concerns and goals of Democrats. Of course, Nunes might have nothing. If that’s the case, he’ll no doubt pay a steep political price. We’ll know soon enough.